A 2-week intensive course at our NoTube EAT Campus in Graz, Austria, where the leading experts on tube weaning work with you and your child in-person to help them learn to eat orally. Support for you and your family by our highly-specialized personnel. Confidence and training to develop skills to handle the feeding situations of your child. Prof. Peter Scheer, MD, and Prof. Marguerite Dunitz-Scheer, MD, the founders of NoTube, have pioneered a methodology to teach your child how to transition to learning to eat in a very short period of time. Over the course of 2 weeks, our interdisciplinary team consisting of highly specialized feeding experts trained on the topic of early eating behavior disorders, tube dependency and tube weaning, will help your child learn to eat without needing a feeding tube any longer. 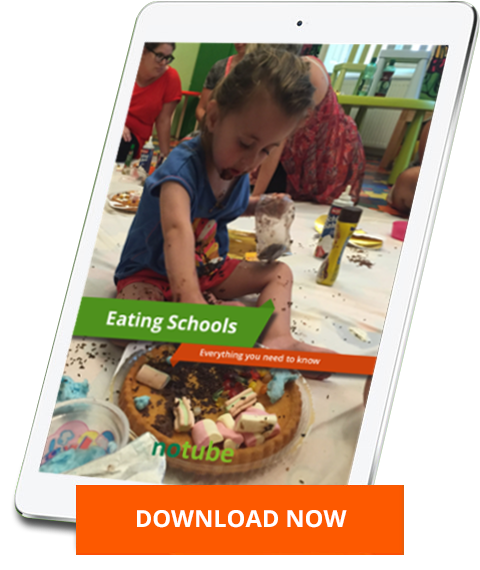 Since the beginning of 2016, Eating Schools will take place at the NoTube EAT Campus in Graz, Austria! The NoTube EAT Campus is nearby the University Hospital for Children and Adolescents as well as the city centre of Graz and in good connection to airport and main railway station. We offer the an child-oriented atmosphere and ideal environment for learning to eat. Why Does The Eating School Work So Well? A safe and supervised environment with three play picnics in small groups with other children and their families, individual and group sessions enable your child to encounter many new situations and to get more autonomous in the feeding situation. This helps to change dysfunctional behavioral patterns and also supports your child to develop and create new skills for moving forwards itself! By working in close cooperation with the respective local hospital, we ensure that even medically fragile children receive the care they need at all times, if needed 24 hours a day. Thus,we can detect illnesses very early on and can help to reduce symptoms. By getting started one week prior to the Eating School on our proprietary online platform with behavioral and feeding adjustments, your child will be ideally prepared when the course kicks off. Similarly, by staying in constant contact up to 35 days after the last tube feed for tube fed children and 60 days after the eating school for picky eaters, we make sure that you return home safely with an eating and weight-sustaining child. As you’ve dealt with hospitals, you know that they are administration-heavy organizations. They often cannot change their policies for all patients even when it would be beneficial for a specific subgroup. At our Eating Schools, though, we make our own rules just for our little patients. This means that we take care of every little detail that may affect your child’s eating success, such as smells, the food that is served and even the soap used in the restroom. We think through all of these issues so that your child can succeed in learning to eat. We’ve worked with kids of all variations of mental and physical disabilities, backgrounds, races, diverse families, and much more. You’ll be treated with the same care and attention we’ve provided to dozens of others. We help your child experience food in a playful and non-intrusive manner and tailor our food to its needs. Children learn by imitation. That’s why during the course, everyone eats together during meal times, even our staff! We have food readily available at all times. It’s also why we strongly encourage the participation of your child’s close family in the course (spouses, siblings, grandparents) since each one of you will contribute to your little one’s success. We do not want any hierarchies to stand in the way of your child’s eating success. We treat you as an equal partner and never advise you to do anything outside your explicit consent. There’s no question too simple or too complex to ask. We’ll answer all of them. While we have years of experience, and we’ve weaned many, many children, you are uniquely qualified to work with your child. We help you help your child. There will be food everywhere. You can rest easy knowing that your child’s special diets and concerns are accommodated. Your child will learn to interact with food in our relaxed play picnics for breakfast, lunch, and dinner. In our Eating School your child will learn new behavior strategies. In individual and group sessions our experts will help you to accept changes in your child’s behavior. The entire feeding team is readily available through the duration of the Eating School to answer questions of all kinds and help you take the next steps. During the night we are always on call and work with closely with the local hospital should your child’s condition require immediate medical attention. Eating School enrollment is limited to 10 families, so you’re ensured to have all the personal time you need with our feeding team. There are two financial investments required to enroll in a NoTube Eating School. We provide a detailed medical questionnaire that you complete. Our experts then evaluate your child’s situation and will open the dialogue about whether your child might be a good candidate for one of our tube weaning Eating Schools. Once you have decided for the Eating School and passed the medical assessment, you’ll begin to participate in our online platform one week before you and your family arrive for the Eating School. You’ll experience a life-changing 2 weeks during the school. And you’ll continue to receive support for 35 days after the last tube feed (max. 6 months from course start) or 60 days after the Eating school for non-tube-fed kids. This way, you can rest assured that we will continue to support you no matter what. The cost does not include accommodations, which must be planned independently. (We are glad to offer recommendations and make this process as simple as possible.) Please read our general terms and conditions for more details. Experience professional medical and therapeutic support on a month-by-month basis using our online platform as you help build your child’s eating skills while staying in your familiar environment. This program is designed as after care program after an Eating School or Netcoaching. Our goal is to dramatically improve your child’s openness towards a wide variety of foods and increase the daily intake of different foods in the long-term. My child has a special diet. Can you really accommodate it? My child has multiple diagnoses. Is it really possible to teach him/her to eat? Should I bring my whole family to the Eating School? How does the cost of the Eating School compare to other tube weaning options? Yes, we can. It might be necessary that you bring your own special powder with you, in case your child suffers from a rare metabolic disorder requiring a highly individualized specific diet, but if it’s only food intolerances and allergies like against Gluten, other cereals, specific proteins like nuts (or any specifically tested nutrient) or religiously based diets, there will be no problem whatsoever. On special demand we can also include a dietician in the preparatory or onsite phase. This very important question is addressed in the pre-assessment where our pediatricians and developmental psychologists check the question of suitability very carefully and specifically. If there is any doubt, we will ask you to provide more videos or ask specific questions needing the involvement of your child’s doctors, but this happens very rarely. Nearly all our patients have a very complex medical history and medical issues on very diverse physical levels like breathing problems, swallow issues, other motor or neurological symptoms, sensory perception issues, and more, and we will summarize their potential influences onto the planned transition from enteral to oral feeding. Yes, please do so indeed! The more your child is accompanied by both parents, all his or her siblings and if possible even grandparents, the more the Eating School experience becomes a special family holiday. And like visiting new countries and new cultures, the adventure will stimulate new skills and facilitate the oral development on many different levels! We take special care to include the whole family and are able to take special measures for helping organize special activities also for the siblings. Tube weaning is a process demanding rethinking of a lot more than just mls passing through a tube! The cost of the Eating School is more expensive than the Netcoaching offered by NoTube. However, it is still much less expensive than any other onsite program and has higher success rates. Find detailed information regarding tube weaning price comparisons here. Not sure if an Eating School is right for your child? Request an evaluation, and we’ll help you figure out the right program for you. The goal of NoTube is to help your child sustain itself with oral feeding. Our Eating School is an online and offline therapy program designed to make it possible. What is an Eating School and what happens there? Who are the people running the Eating School? How can you afford the Eating School? How can you get in touch with alumni of an Eating School?